Let’s run the downloaded file and choose “English” as installer language. Now we need to choose the installation directory of the program where all the files will be copied. After completing this step the installation will be ready. What we need to do now is go on with initial configuration of VLC. So let’s start the program (it will open automatically after the installation is finished). The first thing we will see will be a warning about automatic Internet connection options for updates and retrieving information on media. After accepting these conditions we will see the main window of VLC Media Player. 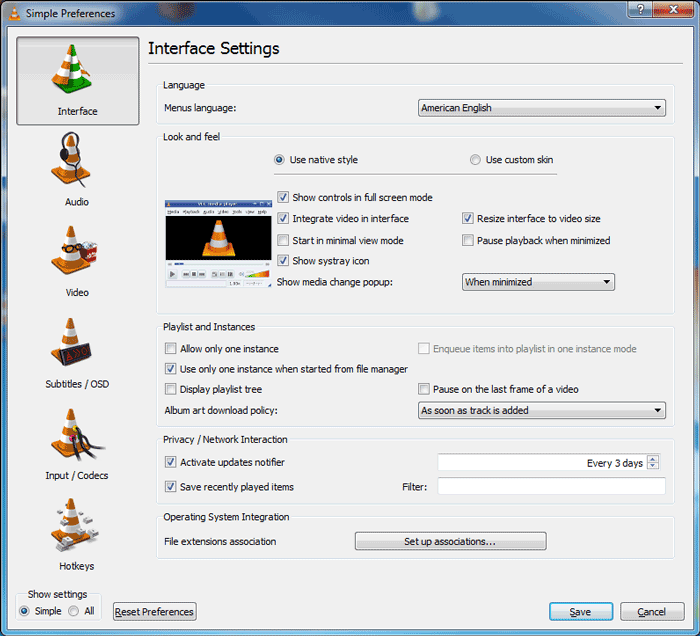 VIDEO section lets us define video playback behavior for VLC, which could be full screen, program window always on top feature, use graphics conversion and many other advanced features for video and snapshots. In SUBTITLES and OSD tab we can configure languages, font styles and other characteristics of subtitles and the way they appear on screen. In INPUT and CODECS settings we can configure optical drives and GPU codecs acceleration. And finally, in HOTKEYS tab we have different key combinations with associated functions of the program. In the same window on the lower left part under Show Settings we have an option to show simple or all settings for advanced settings. If we mark “all”, the program will get us to a more complete menu with more specific options. In most cases we won’t need to change anything in the advanced settings menu except very specific cases. That’s why simple settings mode which we have seen in this guide will be more than enough for us to configure VLC player the way we want. VLC Media Player is a very nice tool for playing the majority of multimedia files and it supports a very big variety of codecs. Anyway, if there is some file that this program can’t open, we can always try other multimedia players available for download on our website.